Medieval Christian theologians had to understand Old Testament books such as Job in terms of Christianity. This need gave rise to a tradition of explanatory notes called the 'glossa ordinaria'. In some Bibles especially for theological study the glossa ordinaria were written around the biblical text in a frame-like arrangement. Additional notes on particular words would be written between the lines. These notes remained standardised through centuries of use. This copy of Job and the sapiential books (Proverbs, Ecclesiastes, Song of Solomon, Wisdom, Ecclesiasticus) with the glossa ordinaria belonged to the Franciscan convent at Canterbury. Sometimes a single sentence of scripture was the subject of many words of commentary, as was the case with the first sentence of Ecclesiastes. 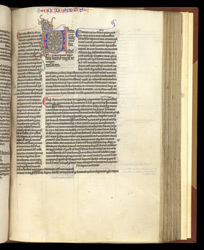 The Bible text is the bit in large writing, beginning with the large decorated letter 'V', while all the surrounding smaller writing is the glossa ordinaria. The wide empty margins were meant for further notes added by theologians as they studied the manuscript.